I am trying to get a list of all the files being generated when MSBuild build a certain project (they should be all the files in .bin directory). 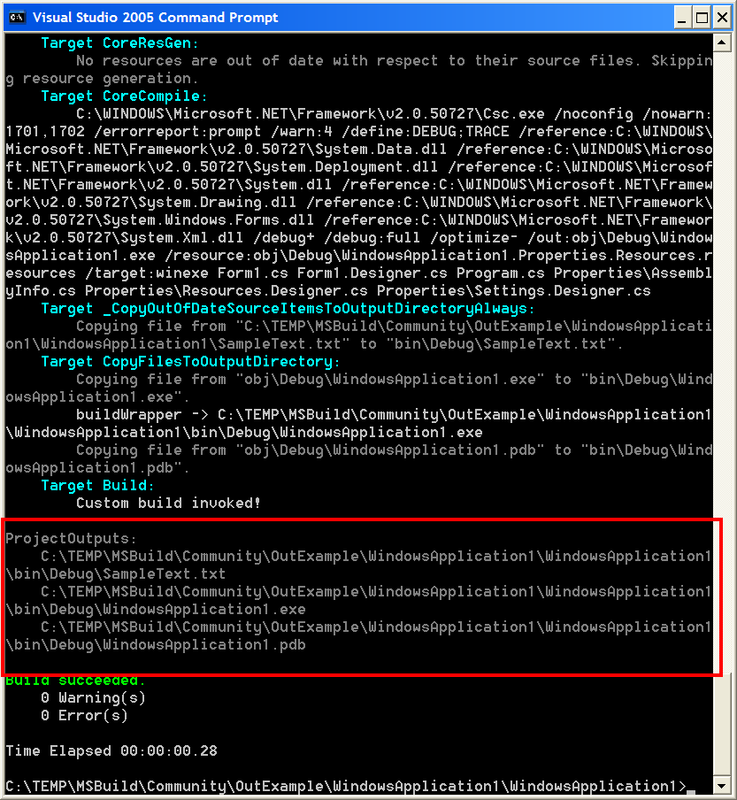 When I used the TargetOutputs in MSBuild task it gives me the main output only, which is the .exe or .dll. But any other files like dependency assemblies will not be listed in the TargetOutputs collection. So it sounds like he is looking for a generic way of determining all the files that have been created (moved) during the build process. I’m assuming that he has a few projects and is using a build script to run the process, and then he wants to move the files to another location. If you have a few projects, then obviously the easiest way is to manually examine the output paths of each project and copy the file as necessary. This is not an ideal scenario, because if you add a project to your process you have to make sure to remember to perform the copy manually. Anywayz, this type of behavior would be useful in many different scenarios. Now let’s talk about how to achieve this. I took another look at the Microsoft.Common.targets file and determined that there is not a straight forward method of performing this action. So, after thinking about this for a little while I think I have come up with a solution. It’s a little confusing, but actually quite simple. This is where you take an existing MSBuild file and without modifying it you add behavior and or data to it. Now let’s see how this idea can be used to add the desired behavior described above. For this sample I have created a sample Windows Forms app, as well as an external build script, buildWrapper.proj. This build file is shown below. The purpose of this target is to define what targets it depends on and to create the outputs, by itself it doesn’t actually perform any action. Because of this we can override it in our buildWrapper.proj file. So the bottom half of the buildWrapper.proj file will conditionally import the project file and then conditionally re-define the Build target. Inside the new Build target we simply examine the output directory and create an item that contains all files that lie underneath it. In the image below you will see the result of this, specifically take a look at the region highlighted in red. Now we can see that we have successfully achieved our goals. Every time I describe this process I feel like it is still un-clear. If you have questions please let me know. How would you enhance MSBuild? The MSBuild team is trying to prioritize their duties for the next release of MSBuild. Because of this they have asked for feedback on how their customers (us) would enhance MSBuild. They are doing this by distributing a virtual $100 across a possible 11 items. Their list actually ends in an item numbered 12, but there is no number 10. Here is a brief overview of their list of options. Here is how I chose to distribute my $100. The only reason to go with 1 is because the solution file is not an actual MSBuild file, otherwise that wouldn’t even be an option. As for option 2, this is not ideal either because it is difficult to inject steps into how the solution build process works. All you can do is really extend what happens before/after the process. As for the debugger, this is a tool that I have actually wanted to write myself for a long time, but never had the time. If there was a debugger for MSBuild, I think that more people would begin to adopt MSBuild as well as get a much better understanding of how it works. It’s not often that teams from Microsoft ask for straight customer feature feedback, if you’re interested in future versions of MSBuild then you should definetly participate in this at: http://blogs.msdn.com/msbuild/archive/2007/11/17/how-would-you-spend-100-on-msbuild.aspx.